Funk and mortality have never been as entwined as they are in the afternoon Glastonbury sunshine. 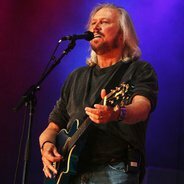 Barry Gibb - the sole surviving Bee Gee - is frequently moved to tears, as are many in the crowd, whilst they bask in the legacy of his former band’s imperious back catalogue. Celebrating the 40th anniversary of their Saturday Night Fever soundtrack, he dips into choice cuts from a voyage into disco-centric nostalgia. There is certainly not a soul in the field not moving to the strains of ‘Night Fever’ and ‘Stayin’ Alive’. Towards the conclusion of his crowd pleasing set, an image appears on the backdrop of his brothers and himself from their heyday. It is greeted with a deserved, large heart-warming cheer. Gibb’s voice shows no real sign of age; remaining, as he does, in command of his falsetto. With a relentless volley of hits and radio mainstays, he provides, inarguably, one of the highlight Pyramid stage sets of the weekend. With Nile Rodgers nodding his head from the side of the stage, the foundations are laid for Chic to take the baton and run with it. And run with it they do. From the moment they burst onto the stage, the party is in full swing. Much like the realisation of the departed Gibb brothers, prior to playing ‘Get Lucky’, Rodgers talks of his brush with cancer and how he was asked to ‘get his affairs in order… six years on, I am now free from cancer’. With time to indulge in David Bowie’s ‘Let’s Dance’ (which Rodgers wrote the music for), he winds up proceedings with ‘Le Freak’ and a mobbed stage for ‘Good Times’, their mission is well and truly accomplished.